I went to the doctor last month for a checkup and told him about my project. I mentioned that I wanted as much data as I could get about myself, so he recommended the ‘super-duper’ blood workup instead of the normal one. Here it is (click for readable version). So it turns out I have some issues. I’m in the red zone for Triglicerides, VLDL Cholesterol, and especially for LDL-P and small LDL-P, where my values seem to be, quite significantly, off the chart. The standard HDL and LDL values, as well as the ratios, seemed to be in the normal range, but I failed the test for these newfangled things. The dash-P in LDL-P stands for particle, and it measures the size and number of particulates in your LDLs. Wow. So I did a little research on LDL-P. It has been well known that elevated levels of LDL, combined with low HDLs, are a risk for heart disease. But lots of people get heart attacks with normal LDL levels. In the last ten years, the research is showing that not all LDLs are created equal – LDLs come in different shapes and sizes. It turns out that – counterintuively – small particle LDLs are much more harmful than large particle LDLs. The small ones are the ones that get stuck in arterial walls, while the large ones are more soluble and float on by harmlessly. For two people with the same LDL levels, those with smaller particles are muchmore at risk for heart disease. Oh boy. I’ve got a family history of heart disease, so I think I need to take this seriously. I’m not really interested in starting myself on medication (statins) that will last the rest of my life. So, I’m going to really focus on my new regime of increased exercise and healthy eating to make a dent in these numbers. Also, I apparently need to bulk up on fiber and omega-3s (oat encrusted salmon for dinner tonight I guess!). I suppose I’ll give it 6 months of diet and exercise changes and then go for more bloodwork. But in general, I’m a little concerned about over-reaction to these kind of tests. For one, I am not an expert. For two, these kind of medical tests and advice seem to go in fads, and change every few years (eggs are bad! eggs are good!). 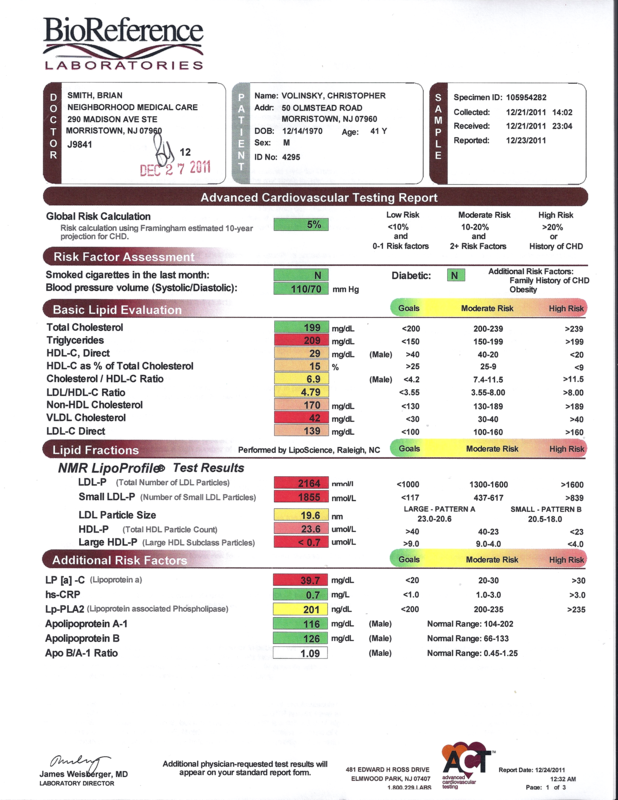 So, for those of you out there who know anything about cardiac health and medicine – please feel free to let me know your view of my test scores and seriousness of this. I’m happy to explore crowdsourcing my health care! The Triglyceride/HDL ratio of 7.2 indicate risk for CVD and diabetes. The mostly pattern B particles in LDL-P confirms it. What is your doctor recommending? Statin to lower TC and LDL? Do you do a mostly carbohydrate diet? As you may know, if you ditch carb, your triglyceride level will fall. Eat mono-unsaturated fat, your HDL will go up. Peter, thanks for this comment. I just posted about my updated numbers – which are somewhat better, but I’ve still got a ways to go. The triglyceride numbers are way down, at least. especially for a stat man. Start at the beginning and work your way through. Thanks for the link. I read the whole series and really learned a lot. Still lots of questions, though! Just posted on my new numbers after six months – some improvment, but more to go obviously. Actually, Saturated fat will raise your HDL – and I hope you have pursued the low carb diet. In addition to what you can learn at eating academy – check out http://www.marksdailyapple.com. Another great bio-hack: test your blood glucose with a glucometer 45 minutes after eating. I’m lean, muscular and my body loves exercise.